Worthington Lower: #MadeInTheUSA Giveaway Ends Today! Welcome to the 2nd Annual Made in the USA Giveaway Hop, hosted by Happy Mothering and The Pistachio Project together with the Green Moms Network! Today is the last day to enter. The winners will be announced on each blog. Worthington Lower is honored to offer you the opportunity to win this awesome prize pack from SprinkledJoy! 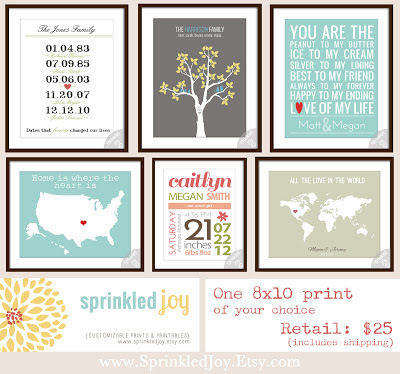 SprinkledJoy is owned by Sarah who lives and operates out of Salt Lake City, Utah. She is a stay-at-home mom to 3 children and this business affords her that luxury. We love to support small business and I can obviously relate to Sarah, being a mom myself. She is living my dream of staying home with my children. Please check out her shops - the stuff is gorgeous! This contest will run through July 13, 2013 at 9:00 pm PST (July 14, 2013 at 12:00 am EST ). The winner will be chosen the following day and announced on WorthingtonLower.com. No purchase necessary. US entries only. Must be 18 years or older to win. You understand that you are providing your information to Worthington Lower and not to Facebook. Please note that WorthingtonLower, Happy Mothering, the Green Moms Network and the Made in the USA event bloggers are not responsible for sponsors that do not fulfill their prizes. We have represented each sponsor with the expectation they will fulfill their prize and in a timely manner. We will contact the sponsor regarding your prize(s). The sponsors, in most cases, are shipping their items to you directly. I will make every effort to assist you obtaining your prize. If there is an issue with a sponsor, please notify the blog you won a prize from within 4-6 weeks for assistance, after that we may be unable to assist you. My fave memory is of having all my family together and setting off fireworks.